Recently author Judyth Vary Baker used some historical documents to make some points on Facebook that were not accurately portrayed. Much like the inaccurate insertion of Kerry Thornley and Eric Rogers into her memoir she has recently taken some events that occurred in Mexico City and has attempted to use them to support her story. This is part one of a two part response to her claims on her Facebook page. She takes aim at the CIA and Sylvia Duran in her post. These assertions do not stand up when examined with all of the evidence you will see in this article. Judyth Vary Baker, Facebook August 5, 2015 12:40 AM EST. Sylvia Duran was arrested twice by the Mexican authorities. What Baker makes seems sinister is actually very logical. Duran was arrested initially because she did not have any kind of diplomatic cover. Duran was recorded on a tape of two phone calls from the Cuban Embassy to the Soviet Embassy on September 27,1963. The phone calls were made on behalf of an unidentified America looking to travel to Cuba. Duran was a Mexican Citizen and therefore was easily apprehended without causing an international incident (1) She was not arrested to torture her and get her to confess to an affair, she was arrested the first time because of the phone call and the fact that this phone call had been tied to Lee Harvey Oswald’s visit to Mexico City. The first arrest and the second arrests of Duran were not authorized by CIA headquarters. At the time of the first arrest, a phone call from Chief of the Western Hemisphere/3 John Whitten (Pseudonym John Scelso) to Win Scott requested that Duran NOT be arrested, but Scott informed him it was too late. (2) This is also documented in a cable from CIA Mexico City to headquarters stating, “…SYLVIA DURAN AND HER HUSBAND HAD ALREADY BEEN ARRESTED.”(3) Whitten responded with a cable from headquarters to the Mexico City Station. 11. In answer to special questions, DURAN said that only she and the Consul are in the Consulate. She said that the first time that Lee Harvey OSWALD was in the Consulate in the morning, to request information about getting to Cuba, she did not observe him very well. In the afternoon, however, when he had the argument with the Consul, she did observe him closely and is sure that he was not wearing glasses. The special questions were asked of her. Alvarado’s story continued to fall apart. It is here that the FBI directs the CIA to turn Alvarado over to the Mexicans. The FBI wanted them to interrogate Alvarado and for them to conduct the polygraph of him. Since they had questioned Duran, they wanted Alvarado to be investigated by them as well, to determine if their stories matched at all. 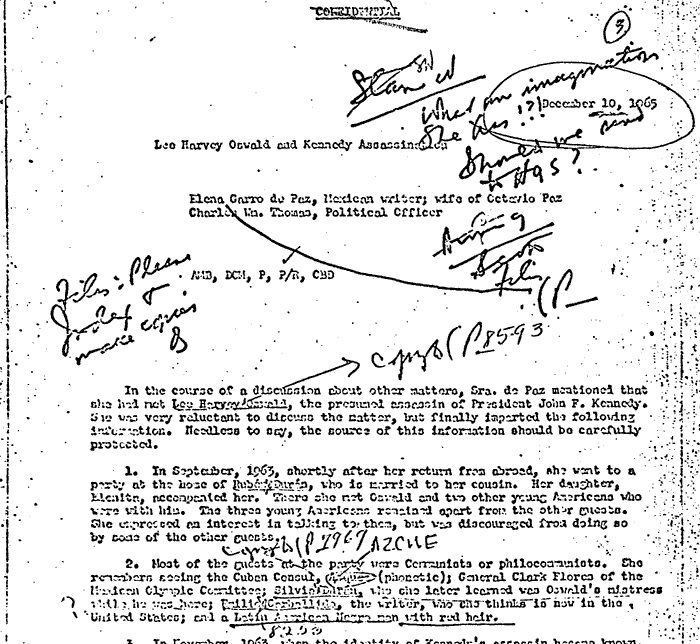 This directive was given to the CIA on November 28 and in the same communication we learn that the Mexicans were preparing to release Duran. It is clear, the CIA was not at all interested in any alleged affair on the part of Duran, but they were interested in determining if the Alvarado story had any truth to it. (22) In the end the Alvardo story did not hold water, and Alvarado recanted it. As for the allegations that Duran slept with Oswald, Ms. Baker should heed her own advice in her post. She quotes from Dr. John Newman and his book Oswald and the CIA. Unfortunately, Ms. Baker does not read the portion of his work about the Duran/Oswald affair. Dr. Newman clearly points out through his outstanding research that the rumors of the affair between Oswald and Duran did not reach the CIA until after the Warren Report was published. This is a critical hole in her statement that Duran was tortured to admit that she was romantically involved with Oswald on behalf of the CIA. The story which evolved over time made it’s way to Win Scott’s desk, on October 5, 1964. (23) In the original version of the story, Ms. Elena Garra de Paz, cousin of Sylvia Duran’s husband, Ruben, claimed to have attended a party in which Lee Harvey Oswald was present at the Duran’s house. The information was passed onto the FBI and she was interviewed on November 24, 1963. There was no mention of Duran having an affair with Oswald in the FBI interview of Elena. (24) Win Scott also wrote a memorandum about the interview and it does not include any details of an affair between Duran and Oswald. At this point both the FBI and Win Scott believe there is not much to report about the allegations because the dates are not in alignment with the established Oswald timeline in Mexico City. By December 10, 1965, State Department Officer, Charles Thomas speaks with Elena, she add’s a detail to the story, that Sylvia Duran was Lee Harvey Oswald’s lover. In addition she makes reference to a red-haired Cuban. This brings back into question the information from Alvarado and his story of a red-headed Cuban who had given Oswald money inside of the Cuban Embassy. What was Win Scott’s reaction to the information that had crossed his desk? Newman concludes that there is credibility to Duran’s assertions that she did not have an affair with Lee Harvey Oswald because she had had an affair with Cuban Ambassador Lechuga and admitted to it. When Duran was interviewed for Newman’s book Oswald and the CIA, she denied the affair stating, “No, no, no. Of course not. I had a relation with someone in the embassy, but not with Oswald…he was somebody you couldn’t pay attention to.” (27) She had high standards, was clearly drawn to powerful men, something Oswald was not based on his behavior inside the consulate. One can see how Ms. Baker’s statements on her Facebook page are misleading. The CIA did not want Sylvia Duran arrested the first time. 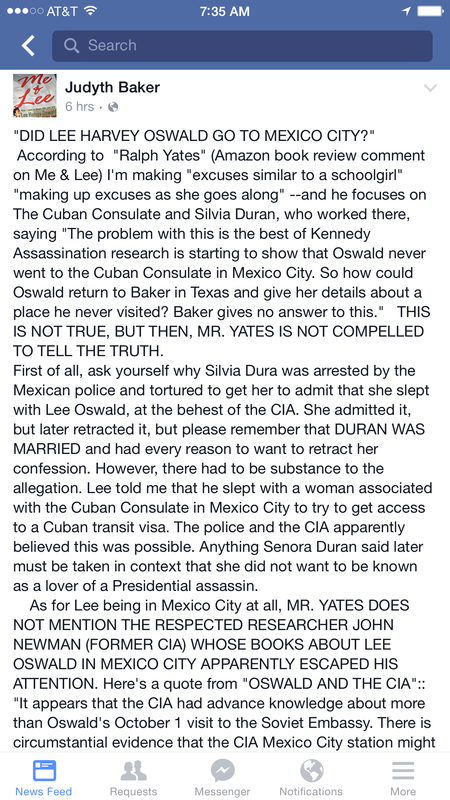 The CIA did not want Sylvia Duran arrested the second time. The CIA provided Mexican authorities with questions for Duran to verify the Alvarado story. The historical record is clear that the FBI investigated the claims of relations with Oswald and found them unsubstantiated. The CIA did not care that Duran had relations with Oswald and there is no evidence that they wanted Duran tortured to admit the affair. It should be noted that in addition to making these claims on Facebook about Duran and the reason for her arrest, she presents a similar statement in her book Me & Lee: How I came to Know, Love, and Lose Lee Harvey Oswald, Future work will demonstrate that her presentation about Lee Harvey Oswald’s trip to Mexico City, is not what she would like her reader to believe, and is not supported by primary sources. Baker is absolutely correct about one thing, Oswald was in Mexico City. Part II will be coming soon. Please note the name Sylvia is spelled Silvia in many of the primary documents. I have tried to keep it Sylvia throughout but when I have cited documents, I kept the spelling from the primary source. (7) HSCA Report, Volume III Current Section: Narration by G. Robert Blakey, Chief Counsel, page 81-82. (16) HSCA Report, Volume III Current Section: Narration by G. Robert Blakey, Chief Counsel pg. 88. (30) Me & Lee: How I came to Know, Love, and Lose Lee Harvey Oswald, Copyright 2010, Trine Day LLC. Refute THAT, Judy V. Thank you very much for this, sir.